The GMS solution is a suit that covers all operational needs of a thermal plant starting from local HMIs, local and remote control rooms and the central control room where everything is aggregated. Developed on the Across® platform, the GMS suit is taking advantage of the latest IT technology. Complete monitoring and control of all plant machinery (engines, gas, steam and hydro turbines) as well as all plant peripheral systems. Comprehensive electrical measurements of the complete plant (units, peripherals, net power, gross power, etc). Advance graphical interlaces with impressive graphics and true real-time updates. In depth historical data of all measurements. Special fault handling with, pre-alarm warnings (projected faults), route cause analysis tools, etc. Unit & plant efficiency calculations (cost curve, load profiles, etc). 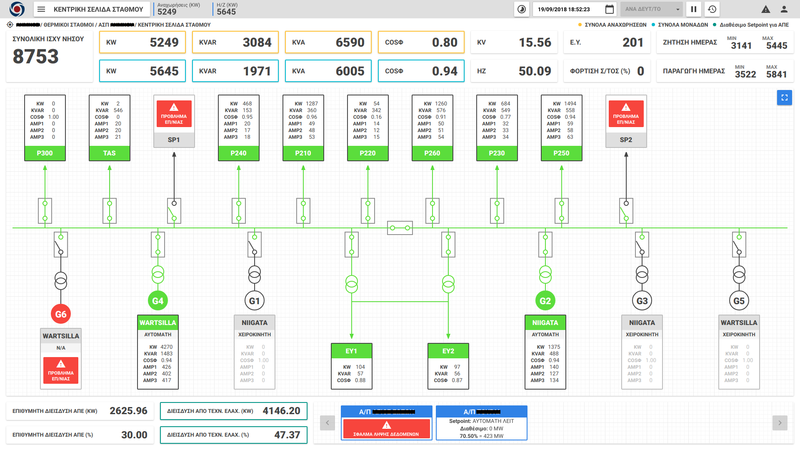 Unit scheduling and power balancing algorithms. Power management & load shedding interfaces. Sophisticated dashboard and reporting engine. Across® PPM is a versatile solution that can accommodate every Power Plant operational need. It has proven performance in local installations of a few hundred IOs up to installation of hundreds of thousands IOs monitoring and controlling several Power Plants in wide geographical area. MAS GMS solution is scalable from a single server to complex redundant topologies with interconnected servers accoss remote locations. Operating power plants at maximum efficiency is a high priority for any generation utility. Different factors such as load conditions, equipment degradation, ambient conditions, and operator oversight may cause the generation unit to operate under less than optimal conditions. MAS GMS enables operators to constantly ensure optimal operation of the generating unit. In large plants with existing “older” control systems, the GMS suit can be closely integrated older unit control system as well as with the plant’s DCS and offers and overall control platform that provides a high-level supervision. It provides advisory inputs to the operator in real time regarding key efficiency parameters both on machinery and auxiliary equipment performance. MAS GMS suit supports functionally and logic that fits all known power plant installations and equipment such as: Gas or Steam Turbine power plants, Engine based Power plants, Hydro power plants. Internal logic support both base load plants and peak shaving plants. Special logic for backup plants had been developed that contributes to the bidirectional control of power as well as to the notion of power source redundancy.